BANGKOK -- A strong earthquake shook northern Thailand and Myanmar on Monday night, smashing windows, cracking walls and roads and damaging Buddhist temples. The airport in Chiang Rai, a northern Thai city near the epicenter of the 6.0-magnitude temblor, evacuated its terminal, where display signs and pieces of the ceiling fell. A well-known temple in the city, Wat Rongkhun, was closed due to safety concerns after the earthquake. "The spire of the main building came off and the tiles on the roof fell off," Chalermchai Kositpiphat, the artist who built the temple, told Nation TV. "I still don't know how we can sleep tonight. ... It was shaking the whole time and then aftershocks followed four to five times. It was tumbling like the Earth was going to explode." The head of a Buddha statue fell at the Udomwaree Temple in Chiang Rai, according to monk Phra Pathompong. Ceilings fell in some homes in Chiang Rai's Phan district, according to local official Wander Radchompoo. A damaged road in the district had multiple cracks, the worst a waist-high gash about the length of three vehicles. People ran down stairs in office buildings in Myanmar's largest city, Yangon, and severe shaking also was felt in Chiang Mai, Thailand's second-largest city. Window curtains briefly swayed in the Thai capital, Bangkok. 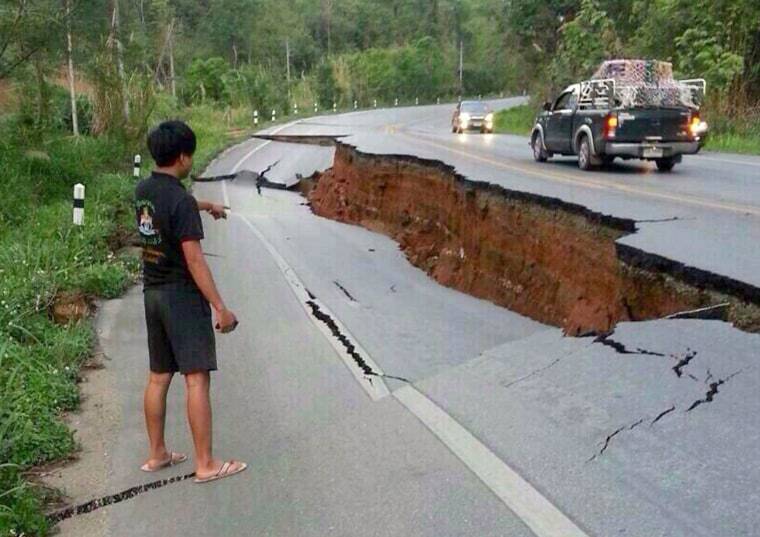 The U.S. Geological Survey said the epicenter was 6 miles south of Mae Lao, Thailand, and 17 miles southwest of Chiang Rai.